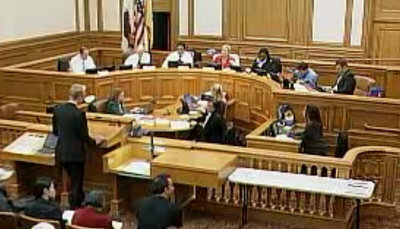 The SFMTA Board of Directors today approved a two-year budget that calls for parking meter enforcement on Sundays and free Muni passes for low-income youth. The budget must next be finally approved by the Board of Supervisors before it goes into effect on July 1. The board favored a free youth pass program for low-income students, but members weren’t convinced that expanding the proposal to include anyone under 17 would be worth the trade-offs in cuts to Muni maintenance that staff presented to the board — at least in this budget cycle. Advocates rebutted agency staff on this point, arguing that the board was presented with a false choice. Sunday parking meter enforcement was also opposed by roughly two dozen speakers, all of whom defended the entitlement to free car parking for churchgoers. However, board members saw past the rhetoric and argued that parking must be managed on Sundays as it is on any other day of the week. We’ll have more on the meeting tomorrow. Well done on stepping up and going forward with Sunday metering. Now does the BoS also step up or go against the board they appointed to handle this very task? Side note: riding down Haight on Sunday afternoon (1ish) leaving Sunday Streets and there is, on average, at least one double parked car per block. We need parking management on Sundays! Then I hopped down to Page, which is just a long stretch of double parked cars (because double parking for church is widely accepted in SF) – which leads to us taking pretty much the rest of the road space and having every aggressive driver in SF behind us. Not pleasant at all. See, the drivers don’t get mad at the double parked cars, they get mad at the cyclists trying to navigate around them. They’re mad at the double parked cars. You just happened to get caught in the middle. I’m new here, but it would be cool to have a youth writer/contributor who’d talk from personal experience about their issues/recommendations for transit in the area? We’re luck in Sf to live in a compact city, but East Bay youth have much longer transit times (and more expensive fares, I think)…anyway, a young person’s perspective on getting around by foot, bike or bus would be great!